Most of the children of remote areas of Nepal are victim of hunger and malnutrition and they’re keep dying following the links what Nepalese media have written about the real condition of children these days in Nepal. 61% of remote areas’ children of Mugu District of Nepal are critically malnutrition. 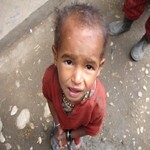 In Kalikot, Nepal 824 children are in malnutrition and 301 are highly critical ..